Vashti's cultural heritage is Mexican and Colombian, which influences this choreography. 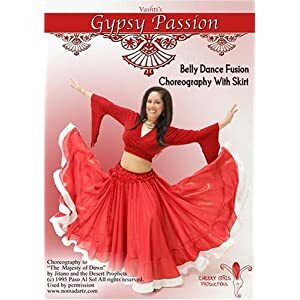 Don't misunderstand the term "gypsy" - she's used the word to emphasise that it's a somewhat flamenco-style fusion, but it's not pure flamenco. I realize that can cause confusion for some people, because they're expecting to learn Romany or Turkish gypsy style from this DVD - but I have to say, as a former flamenco dancer, I appreciate the respect Vashti shows by not using the "flamenco" tag lightly. If this was pure flamenco I could pick a few faults, but it does give you good instruction on how to use the skirt as a prop, and highlights the differences in arm movements and posture. It's a nice routine, achievable for beginners but still enjoyable for intermediates (who will probably add their own variations). Small gripe - she doesn't always mirror the movements (i.e. when she says "right", she moves her right side), which is confusing if you're trying to follow. Sometimes she uses assistants, facing away from you, to do the moves as well - unfortunately they don't always manage to stay on camera, so it's not always a huge help! No items matching the keyword phrase "Vashti's Gypsy Passion DVD" were found. This could be due to the keyword phrase used, or could mean your server is unable to communicate with Ebays RSS2 Server.